Republican incumbent U.S. Rep Will Hurd and Democrat Pete Gallego are battling it out in a sprawling, idiosyncratic district. BRACKETTVILLE — In Texas’ sprawling 23rd Congressional District, everyone knows about Donald Trump, the blustery billionaire on their five o’clock news every night, causing arguments at their dinner tables and leaving them desperate for this election season to end. "Any time it says Clinton or Trump, I just swipe by it," said Catherine Cano, a retired teacher scrolling through her phone here at a bakery Tuesday. "I'm not heading for the border — yet." This November, Democrats are hoping the ubiquitous White House race will play a starring role in dislodging Rep. Will Hurd, a San Antonio Republican who's never endorsed Trump but shares his party designation on the ballot. Hurd again faces Alpine Democrat Pete Gallego, who is confident voters of the majority-minority 23rd District will punish Hurd for Trump's inflammatory candidacy. Yet like many things in this vast and idiosyncratic district, it's not that simple. On a recent drive across the district — nearly 600 miles along the remote Highway 90 — voters were anything but uniform in viewing the presidential and 23rd district races as one and the same, or even similar. Trump, many said, is a unique specimen. "He's totally different than anybody," said Traci Koch, the owner of a boutique along the main drag in Hondo. "He's his own person. Maybe that's what we need." Even without Trump at the top of the ticket, the Hurd-Gallego rematch was always bound to be dramatic. It’s unfolding against a rare backdrop in Texas’ GOP-dominated politics: a truly — and perennially — competitive district where candidates are forced to appeal to the ideological center and cannot sit back once the primaries end. Kicking off his campaign in July, Hurd proudly called himself "one of the few Republicans in Texas who actually has to talk to Democrats." Gallego, a former longtime state lawmaker, also trumpets his bipartisan credentials — and how they meld with the swing district. "For me, growing up in West Texas, it's really important — people who live out there are independent by nature," Gallego said in his first — and likely only — debate with Hurd on Thursday. "They don't necessarily go for one political party or the other. They do the right thing for the right reasons." Describing the largely rural district often requires superlatives. It’s one of the biggest in the country, covering an area larger than 29 states as it stretches from west San Antonio to just short of El Paso. Along the way, it hugs the majority of Texas' border with Mexico — and far more Mexican border than any other congressional district in the nation. "So long, so big — it encompasses all kinds of people," said Pete De Hoyos, a 70-year-old Hurd supporter parked outside an early voting location Tuesday in Del Rio. "It has Democrats, Republicans, liberals and conservatives — and everything in between." That diversity was on full display during the drive through the district. For every diehard partisan, there was a self-avowed ticket splitter. And for every Democrat pleased with the direction of the country, there was a Republican less than satisfied — often incensed — with the way things are going. "I want to vote out everything that's happening right now," Amanda Eubanks, 40, said as she walked her dog in downtown Alpine. If voters had a beef with Gallego or Hurd, it was often because they viewed either candidate as not paying enough attention to constituent services during their congressional tenures. In those cases, Trump was a secondary factor, if a factor at all. Seated in her living room Monday in Marathon, Francie Broderick praised Gallego's office for helping her son, who has a pre-existing condition, sign up for the Affordable Care Act. It was not until later that Trump came up. Hurd "hasn't challenged Trump on any of the offensive things he's said about anybody," said Broderick, a retiree whose front yard is lined with Gallego, Clinton-Kaine and Black Lives Matters signs. "Anybody who doesn't stand up against Trump doesn't stand with me." Shortly after Trump became the presumptive nominee in May, Hurd said he could not support Trump until the nominee showed he respected minorities and understood national security. Hurd held that position, which did not rule out an ultimate vote for Trump, until earlier this month when a 2005 clip surfaced showing Trump speaking lewdly about women. That prompted Hurd to fully disavow Trump, calling for him to drop out of the race. The fallout from Hurd's decision illustrated just how tough of a situation many down-ballot Republicans are in when it comes to Trump. It did not satisfy Gallego, who is now criticizing Hurd for doing too little too late to oppose Trump. And it even upset some Republicans who still believe the party should be united behind its presidential standard-bearer. "For Will to bail on him is crazy," said Jim Westermann, who owns a sign shop in downtown Alpine. "When he says, 'I'm not voting for Trump,' by default he's voting for Clinton." Asked if he still planned to vote for Hurd, a frustrated Westermann did not exactly say. "I wish I could find a way to spank him — take him out to woodshed and send him back," Westermann said. When it came to the top of the ticket, there was deep discontent across the district with both major-party nominees, especially among Republican and undecided voters. More than one voter used the “embarrassing” to describe the choice between Clinton and Trump, lamenting that the parties could not produce better nominees. “This is the election between the two crappiest candidates I’ve ever seen for president,” said Bob Steele, an Alpine attorney who was in Westermann's store, seated at counter strewn with stickers reading "Texit" and "In God We Trust." “They both have big issues." Trump, of course, seemed to evoke stronger emotions. No Republican seemed particularly enthused about voting for him — and that was among those who had made up their minds. "I am a dyed-in-the-wool Republican but I don’t know who I’m going to vote for yet," said Cheryl Viner, Cano's daughter who was waiting with her for their order at Darla's Kitchen. "I’m trying to find the lesser of two evils." Whomever voters ultimately pick, Democrats are hoping the outcome will spell doom for Hurd. Gallego has been aggressive in portraying Hurd as not that different from Trump on the issues, or at least too timid to make known his disagreements with Trump. Delfin Lopez, a retired veteran walking out of the Presidio County courthouse Monday in Marfa, laughed when asked about the notion that Hurd is like Trump. "I don't know who said that, but that was a stupid remark," said Lopez, who is supporting Hurd this time but has previously voted for Gallego. 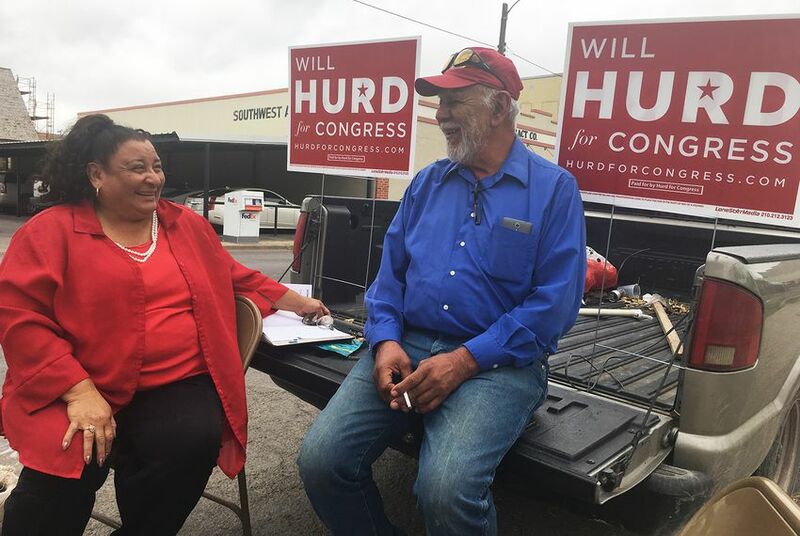 "To me, it's not a salient argument because I'm informed to the point I can distinguish" between Hurd and Trump, said Gustavo Sorola, a retiree who was volunteering for another Republican candidate outside an early voting location Tuesday in Uvalde. "I can see through that." But maybe, Sorola added, it is not as clear to the average voter. With under two weeks until Election Day, few voters seemed certain about how things would turn out in the 23rd District. The race is expected to be close to the finish, with both sides projected to spend over $12 million combined on TV ads by Nov. 8. One thing voters, even Republicans, were more sure of: Trump is likely doomed. Already resigned to his fate, some GOP voters said they were at least hoping their party would keep its congressional majorities, which would work to hold accountable a President Clinton. That's an argument Hurd has been increasingly making since he fully distanced himself from Trump. On TV screens across the district and in the debate Thursday, he pitched himself as the "only candidate in this race that's willing to stand up to Donald Trump and Hillary Clinton." "I want to keep the House and the Senate," said Pamela Franzheim, a straight-ticket GOP voter leaving the Presidio County courthouse Monday in Marfa. "I want to keep some control in the House, even if we're going to lose the presidency — which it looks like we may." In a debate, Democrat Pete Gallego accused U.S. Rep. Will Hurd of not doing enough to oppose Donald Trump's candidacy. Hurd charged that he's a more effective congressman than Gallego was. National groups are saturating the airwaves in the only competitive U.S. House race in Texas. Most Texas Republican leaders have largely stood by Donald Trump, but one has fully distanced himself — U.S. Rep. Will Hurd, locked in a heated rematch with Pete Gallego.